Mathematically defined, the Midwest Radical Culture Corridor is the most improbable set of life-lines connecting any two deep-rooted points of resistance. Its proliferation is achieved by agile steps to the side of the neoliberal status quo. From the air, the whole thing is totally invisible. On the ground, it’s indicated by exit-signs from the Petroleum Time-Space Continuum. In actual fact, the MRCC is best viewed eye-to-eye. 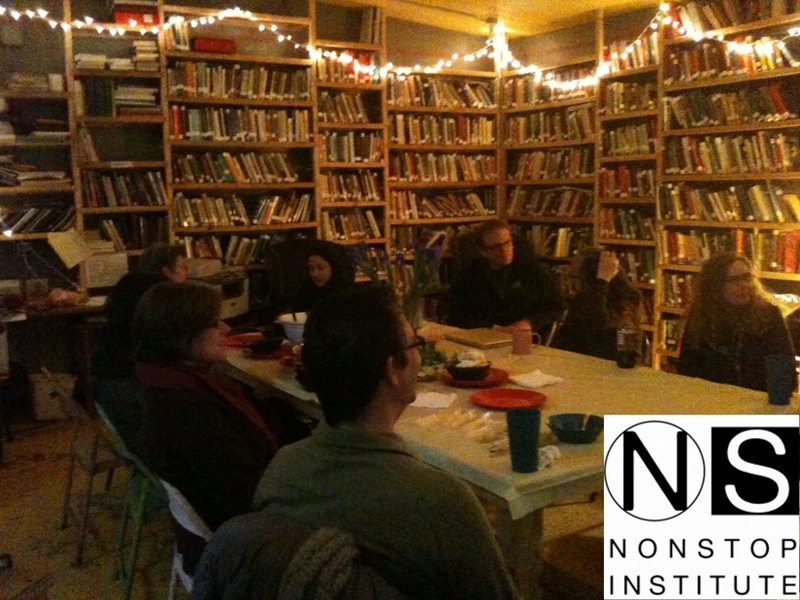 These were the perfect conditions that members of the Compass Group found at the Nonstop Institute in Yellow Springs. Exactly such an impassioned discussion unfolded over the next couple hours. Claire and I had entitled our lecture “Double Movement.” It was basically the story of how the ideas of Continental Drift had emerged, why it then morphed into an exploration of the MRCC, and how the “lure of the local” was leading us on to the pampas of Argentina. Of course we also had some time for our ideas concerning capitalism and cosmology, not to mention contributions from our old friend Karl Polanyi. Perhaps we will find time to write that all up some day. Anyway, at the end Ryan and Sara and Rozalinda came up to join us and great conversations ensued, as people asked questions about the Midwest Drift and Mess Hall and the project in Argentina, and came up with their own ideas about what the limits of capitalism currently are and how to overcome them. Hopefully they will put all this up on the web very soon, so you can see if you want to. On the next night, we saw the art work of the Cuban-born exile Juan-si Gonzalez who connected the dots between exotic Midwestern locales with names like London, Damascus or Lebanon, offering glimpses into his own migrating destiny along the way. This set the stage for a presentation of Nonstop by a few of the protagonists, with much additional commentary from the “audience” who, on this night, were all full-fledged participants in the adventure. This was no mere celebration of glorious achievements, but instead a gentle and sober look at the pragmatic difficulties of sustaining past accomplishments, along with some questioning about the paths to be taken in the near future. The most interesting discussions for us seemed to turn around the subleties of mixing art, education, media and the politics of public space. Nonstop is really a laboratory for live experimentation in the realms beyond the old liberal humanities education. Their research program last year had turned around the current university crisis, with a series of skype interviews that can be seen right here. Our conversation together echoed with the larger analysis, but tended to go straight to the point of what those in the room thought they had already achieved, along with plans and speculations and questions about what to do in the future. Yellow Springs is located next to the Wright-Patterson Air Force Base which has an immense military museum featuring all the fighter jets and bombers and missiles you could wish had never been built, much less used, but they were and have been and still are. This is a heavily militarized area and full of reminders of what the United States is becoming in the twenty-first century. However, anything can happen and over a long breakfast on Sunday we discussed it all, including how to subvert the Air Force, how their research guys feel uncomfortable “inside the fence” and whether it might be possible to fly to the blue sky outside it. We also evoked the need for some kind of “pre-enactment” touching partially on the Extreme Makeovers that seem to be planned for all walks of life, and also on the possibilities of resisting and creating entirely different destinies. Some ideas were mooted for a great Midwestern convergence to put the radical back in the corridor. This is likely to happen in one form and/or another. So stay tuned and keep it eye-to-eye! This entry was posted on March 28, 2011 at 4:57 am and is filed under Uncategorized. You can follow any responses to this entry through the RSS 2.0 feed. You can leave a response, or trackback from your own site. This is a wonderful summary of the Compass group/Nonstop event. It was a great pleasure to host Brian and his comrades here in Yellow Springs. Our two events with the Compass group were among the most stimulating times I’ve had all month. While the faculty-in-exile did a terrific job of teaching during the year of Nonstop 1, they did not “manage to complete the education of the last Antioch students.” Indeed, several of Nonstop’s core students began their Antioch education that year, while the rest of us had more than a single year’s education to complete. (Being unaccredited, Nonstop was not in a position to grant degrees, even if one or more students had been in a position to complete their education.) The betrayal of the “reopening” Antioch College is in failing to recognize students-in-exile as rightful Antioch students, just as its failure to acknowledge faculty-in-exile as rightful Antioch faculty. Also, many of the old staff were rehired, but up until a mere four days before the Compass group arrived in Yellow Springs, none of the FACULTY had been hired to permanent positions in the new college. The college denied right of first refusal to formerly tenured Antioch faculty, and through various means, has managed to exclude Nonstop faculty from all of the six initial tenure-track faculty positions. 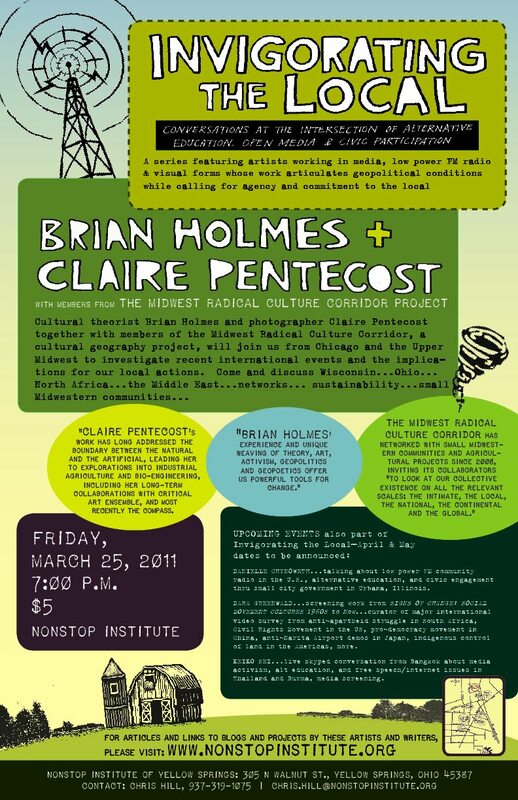 Those of us who attended Brian and Claire’s presentation at Nonstop (Yellow Springs) and participated in the expanded the evening’s conversation (that also included Ryan Griffis, Sarah Ross and Rozalinda Borcila) were invigorated and inspired by the integration of economic and cultural theory, grounded in direct experience and careful feedback offered by presenters and audience members. Conversations about crises in higher ed in the US and food production in the Americas, among other topics, shifted between the scale of the intimate, the territorial, and the continental. The second day’s salon with artist Juan-si Gonzalez and other Nonstop members and longtime collaborators, a walking trip of Yellow Springs on a brusque early spring afternoon, a road trip to the nearby Air Force Museum, and plenty of good food afforded additional opportunities to exercise our histories, personal and collective. What Yellow Springs folks have remarked upon over the past weeks in reflecting on the weekend with Compass members was the extended opportunity for dialogue on so many issues that intersect around education, public space, and economic/cultural health. It was also important for many of us to share the dynamics of local struggles and strategic inventions to which we’ve applied ourselves as educators, artists and activists for the past 3+ years with visiting artists and educators who value a direct and material encounter with the sites and stagings of our resistance as well as our ongoing projects. The weekend was a communicative feast in the sense that a feast suggests a corporeal and nurturing exchange, and it created an orientation for future work. We thank the Compass members for extending the Midwest Radical Cultural Corridor eastward to Yellow Springs.